The fight to protect your brand online is never truly over. No matter how many enforcements you take, how many marketplace sites and listings have been shut down or how many third party platforms are monitored, it is never possible to eliminate all instances of infringement. That said, it is possible for brands to protect themselves from the impact of infringement; but to do so, they must focus efforts where activity proves most damaging — where consumers shop. Brands already have a consumer-centric approach to everything, from customer service to in-store and online experiences, so it makes sense that they also adopt a consumer-centric approach in online brand protection. 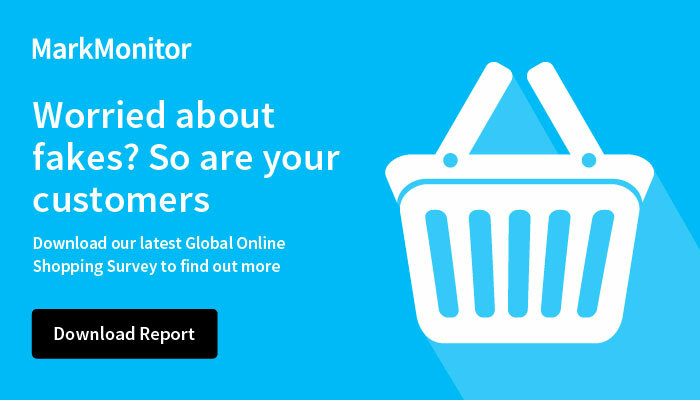 According to a recent MarkMonitor barometer report, more than one-quarter of consumers have at some point unknowingly purchased fake or counterfeit goods, which represents a considerable loss of revenue for many genuine brands. A consumer-centric approach to brand protection aims to recapture this revenue from well-intentioned consumers (those looking to purchase genuine products) by identifying how they’re being duped into making counterfeit purchases and working backwards to develop a successful protection strategy. But how can brands achieve this? Firstly, consider the fact that about 91 percent of people do not look beyond the first page of search engine results¹, and about 70 percent of consumers don’t go past page one on marketplaces². Eliminate from your strategy the websites, pages and advertisements that consumers don’t see, so you can target the biggest offenders. Eliminate from your strategy the websites, pages and advertisements that consumers don’t see, so you can target the biggest offenders. Why focus on the “well-intentioned”? Remember that the thought of being fooled doesn’t even cross most consumers’ minds, so it’s important to remove the most visible instances of infringement as quickly as possible, or else face damaging consequences. By prioritizing this — while also ensuring that all remaining visible sites on search engine results, online marketplaces and elsewhere are legitimate — brand owners protect both brand reputations and their consumers. We use the term ‘well-intentioned consumer’, because there may be a small percentage of consumers that will intentionally seek out counterfeit goods. The legitimacy of a product is of no interest to them: they are simply looking for the best deal. While these consumers are therefore not a priority — it’s going to be unlikely for them to purchase genuine product in the first place — brands should still use the consumer-centric brand protection approach to make it as difficult as possible to actually find and purchase counterfeit goods. Geo-specific searching leverages thousands of IP proxies to differentiate search engine and marketplace results from one country to another. To create the most effective consumer-centric brand protection program possible, it is often in the best interests of brands to work closely with a trusted external provider. The right provider can leverage experience and expertise to more accurately identify the most visible instances of brand infringement and deal with them in the most efficient manner. Geo-specific searching leverages thousands of IP proxies to differentiate search engine and marketplace results from one country to another, helping to mitigate the risk of counterfeiting on a global scale. Some providers can also provide a threat level analysis, which uses data science technology to predict the online listings most likely to be infringing and help brands enforce appropriate measures as quickly as possible. Online counterfeiting and infringement can have a crippling impact, resulting in lost revenue, operational disruption and damage to overall brand reputation. While the threat will never disappear, it can be reduced by focusing on what your consumer sees. By working with brand protection specialists to identify the traps that consumers are most commonly falling for and by dealing with those effectively, brands can maintain positive reputations and recapture revenues that they have been long missing out on. For more information, download this introductory sheet on consumer-focused brand protection.